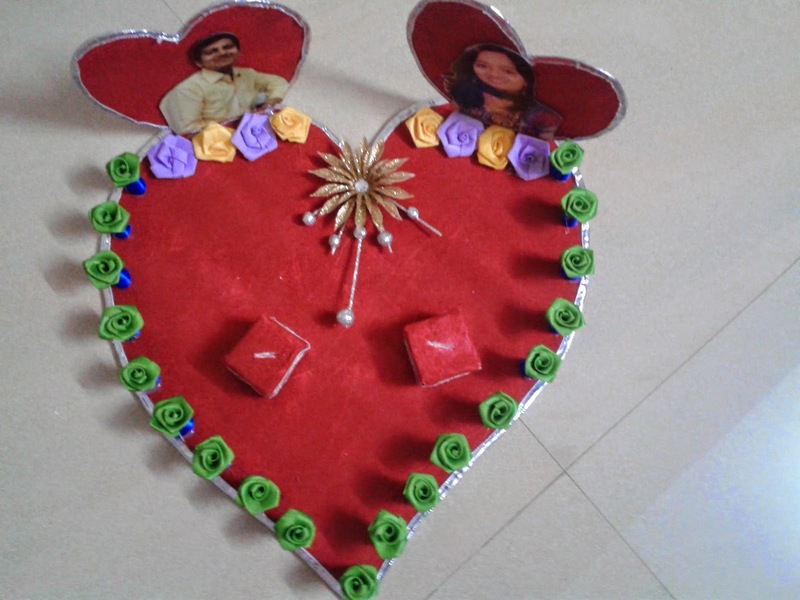 Here is one more item that was crafted for my engagement. The engagement ring tray itself!! We browsed the markets in Mumbai to find a decent tray. But either we didnt like the designs or they were just way to expensive!!!! Hence came up with making a tray at home itslef!! Due to crunch of time, was not able to click pics when the making was in progress, but have the final shots!! Hearts... is what our theme has been. 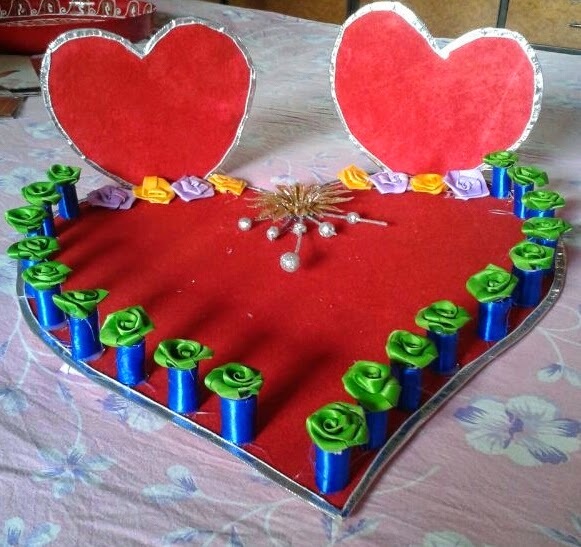 Even our invite was full of hearts!! :) The entire border was made out of scraps. Thick magazine pages cut out in small size and rounded them up. Stuck blue ribbon over it. The green roses are from local shop. Red paper is velvet paper. here is the entire completed tray, with the pic of the bride and groom :) The photographer loved the tray and did a photoshoot of it :) And my in laws loved it as well!! Do let me know how you liked it!! To link any of your cards/projects, click on the title of your post (after you have posted it) copy and paste it into the link on the inlinz and put your name and email address in the boxes and thats all you need to worry about. Beautiful project and your attention to detail is FAB! Thanks for sharing with us at Really Reasonable Ribbon. 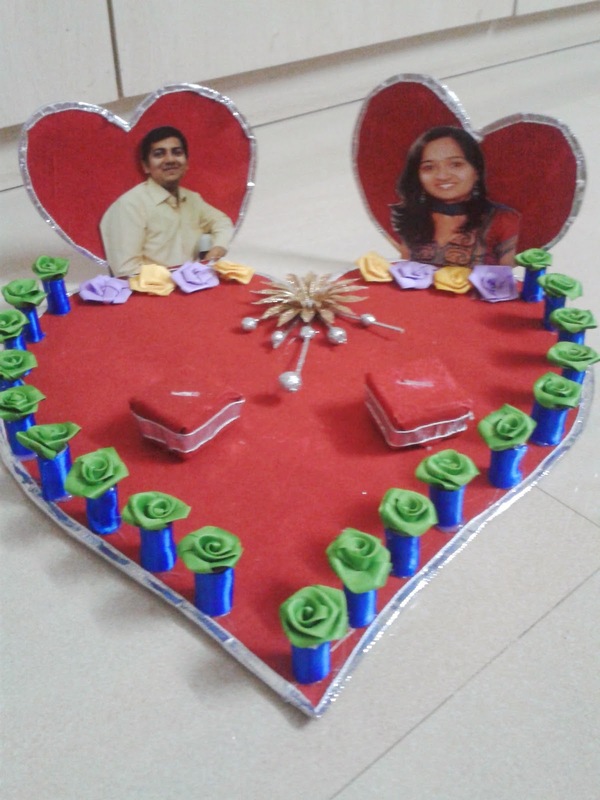 Bijal you sure are having lots of crafty fun for your wedding!!! Treasure this !! It is so precious! !